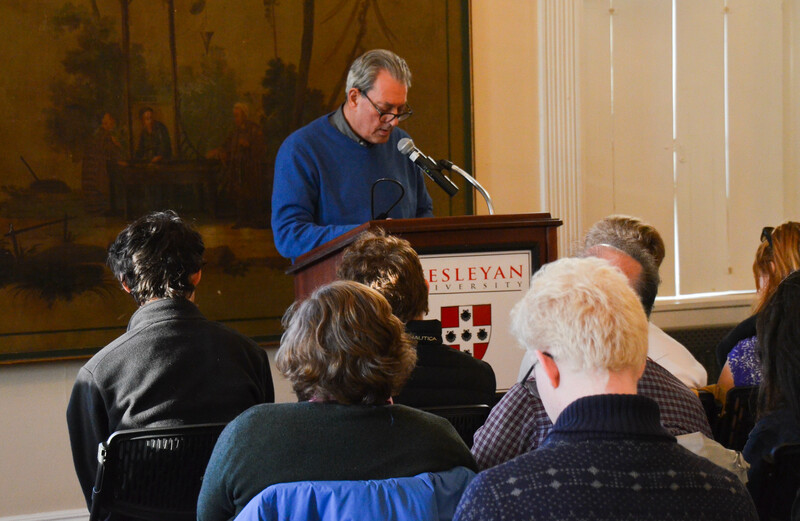 Last Wednesday, Paul Auster was driven up to Middletown from New York. Wesleyan’s 2018 Millett Writing Fellow decided to treat himself to a car service because he figured that he could get some sleep on the ride back to Brooklyn when the Q&A, reading, and dinner with students were all over. After all, he had been up since 6 a.m. working on the manuscript for a new book, a biography on the life of Stephen Crane. Auster explained all of this upon introducing himself to me in the Downey Lounge. I was fortunate enough to get the chance to take the acclaimed writer out to lunch. After meeting in Downey, we traveled down to Main Street and sat together in Brew Bakers for an hour and a half. I said that I liked to think so, after spending almost four years here, and before I knew it, Auster had launched into a story about the University’s firing of his old friend Keith Waldrop of Burning Deck Press decades earlier. During a class, Waldrop had slowly ripped his doctoral diploma to shreds while explaining some related philosophical concept. When an old guard coot on the faculty caught wind of this avant-garde lecture, the ensuing uproar led to Waldrop getting the ax. Although I had already been told this story before, hearing it from the perspective of a literary hero of mine was something else altogether. Over the course of our lunch, I asked Auster about his time working as a census-taker in Harlem, and he told me that memories of those early days out of college were the spark that led to “City of Glass,” the first book of the lauded New York Trilogy. For those unfamiliar with Auster’s work, his writing is often defined by a lack of boundaries, with respect to both narrative voice and genre. In over 50 years of writing, he has authored more than 30 genre-bending works, including novels, memoirs, short stories, essays, poetry collections, and screenplays, which have collectively garnered far more awards than can be listed in full here. While often pegged as an absurdist writer, Auster has repeatedly rejected this label, and virtually all others, insisting that an individual story should be defined by its contents rather than outside elements, such as industry standards or reviewers trying to coin a new term. We talked about his most recent work, 2017’s “4 3 2 1,” a 900-page novel that tells four potential lives of the same person growing up during the ’60s. The book was shortlisted for the Man Booker Prize. The estimated six-year project, in the end, took closer to three and a half years to write, and when I asked whether or not his anxieties fed into the character development of Archie Ferguson, the book’s protagonist, Auster responded that interpretation is not his responsibility as the author. “I have no idea, that’s for you to judge,” he said. Auster’s unique style is best summed up in an anecdote that Assistant Professor of English Hirsh Sawhney shared during introductory remarks at Auster’s reading later that same evening. Toward the end of our lunch, I had one last question for Auster. “As an aspiring writer who’s about to graduate, do you have any advice for me?” I asked. “Well, I would love to be writing novels,” I decided after a while of tiptoeing around a definite answer. This viewpoint is nothing new for those familiar with Auster’s public remarks in the past. In 2012, in a controversial move, Auster had decided against a promotional tour in Turkey, protesting the country’s treatment of journalists critical of Recep Tayyip Erdoğan’s government. And with that, our conversation was over. I checked my watch, noting that we had better get going or he would be late for his Q&A session. We collected our things and made our way back to campus.